BUY MY SWEAT SIX MONTHLY PASS NOW! Yoga Six are experts at what they do, Yoga. Studio SWEAT are experts at what we do, kickin’ Cardio and Strength Training Workouts. We are only 1 mile apart with studios built to give you the best experiences for your workout of the day! Get 24 Workouts (up to 12 per studio) per month with your “SWEAT Six Monthly” pass by clicking here to sign up, by emailing reservations@studiosweat.com to say you want to try the SWEAT Six Monthly, or you can stop by the front desk next time you’re in! You’re SWEAT Six Monthly begins the day you sign up for it. Next Re-bill date is on the same day the following month, unless you cancel, which you can do anytime! No commitment beyond 1 month at a time! For the “SWEAT Six (6) Pack“ of classes enjoy a one time offer per customer for 50% off 6 Classes (Normally $120) at Yoga Six!!! 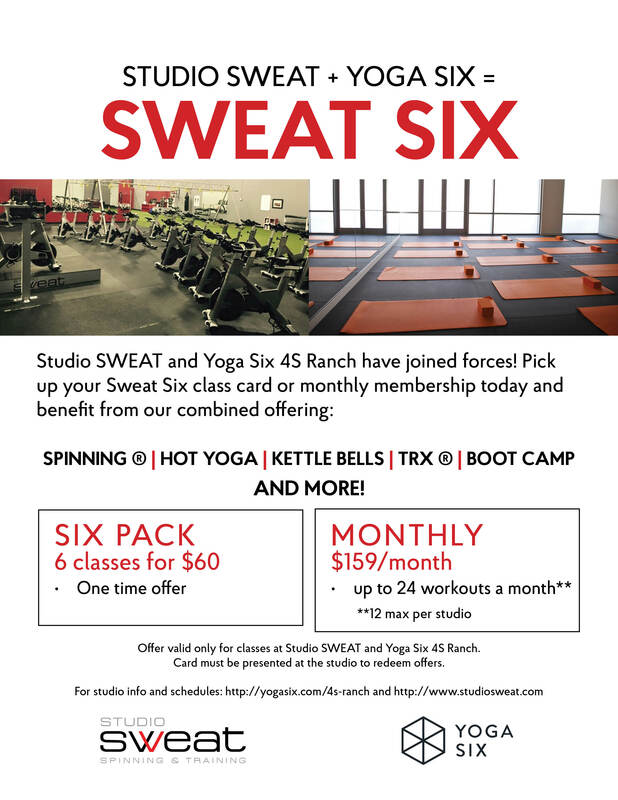 You just pick up a “SWEAT SIX” business card from Studio SWEAT (check the front desk and on top of the red cubbies) which you then present at Yoga Six and they will get you all set! Checkout studio information and class schedules at http://yogasix.com/4s-ranch and https://www.studiosweat.com now!